Preheat oven at 180 degree. Grease baking dish with butter or oil and dust it with maida. Take a bowl, add flour, cocoa powder, salt, baking soda, baking powder, sugar and sift it. Add vanilla essence, condensed milk, butter, cold water and whisk it. Pour the batter into baking dish and bake it for 30 minutes. Insert the knife or toothpick to check it if it is done, if it comes out clean it is done, otherwise, bake it for 5-7 minutes more. Take out the cake and let it cool completely. To make syrup - Take a pan, add sugar, water and boil it till sugar dissolves. Keep it aside. To make Icing - Take a bowl. Add cream, vanilla essence, sugar and beat it. Keep it in the refrigerator. For Icing- Cut the cake horizontally into two. Keep one half aside. Sprinkle sugar syrup on the other half. 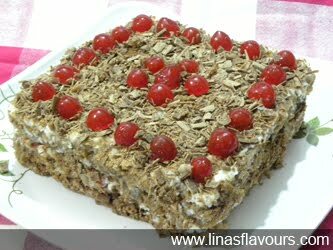 Spread icing evenly on the cake and sprinkle chopped cherries and chocolate shavings. Place other half on it. Again sprinkle sugar syrup and spread icing on the top and sides. You can decorate the cake on the edges with a decorative nozzle. Sprinkle chocolate shavings and top it up with whole cherries. Cover the sides with chocolate shavings. Cover the cake with a big bowl and keep it in the refrigerator for about 1 hour. Cut into slices and serve.